Hello there, I LOVE the name of this stamp set by Clearly Besotted. I also love the contents of this stamps set, how cute are the squirrels? 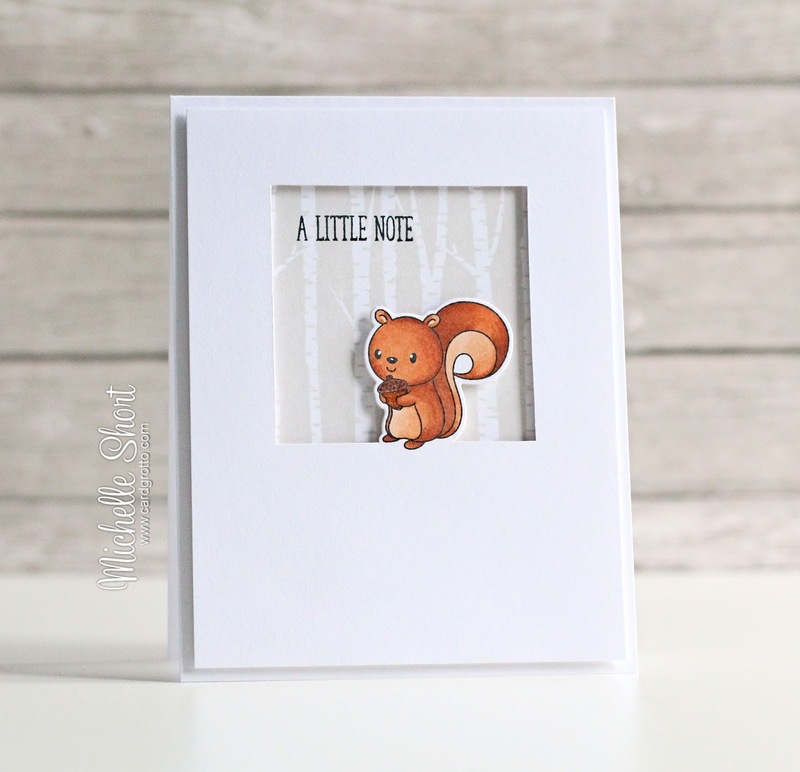 I have a card to share today combining the Nutty But Nice set, along with the Birch Background II stamp. 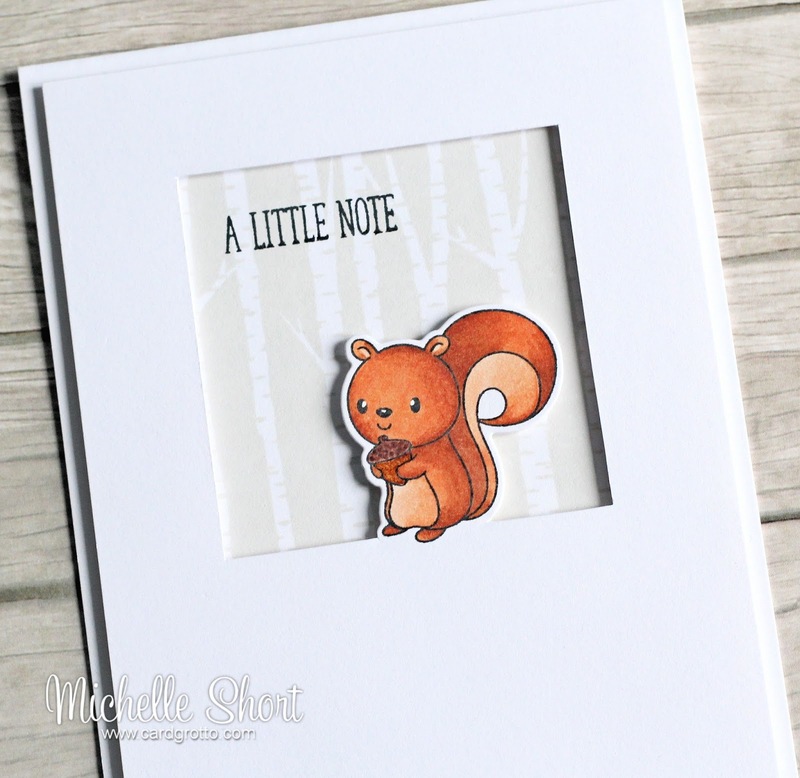 I started off by partially die cutting the squirrel die on to a panel of white cardstock. I wanted to keep the foot part intact so that I could cut an aperture around it. I did this using a craft knife and a ruler (I find this the easiest way to do it). I then stamped the squirrel image on to the panel and coloured him using Copic Markers. I then took an A2 white card base and masked off the edges of it. The Birch Background II stamp was stamped on to it using SSS Fog ink. I then stamped the sentiment, from the Many Mini Messages set, in the top left hand corner using black ink. The squirrel panel was then added on top with foam tape. To finish off, I added a little glaze pen to the acorn and white pen to the squirrel's eyes. COPIC MARKERS: Squirrel: E21, E97, E99, E39, R00. Acorn: E23, E25, E27, E29, E49. Thank you so much for visiting me today. I apologise again that I am so late with my Clearly Besotted teasers but I hope you are still enjoying seeing them! Have a great day! Just so adorable, Michelle! Cute image, beautiful coloring and lovely design. So cute, CAS perfection as always! What a sweet little squirrel!! I've not been online in a while and I've missed these cute little critters!! Great card!